Since the 1970s, the Internet has evolved rapidly from a few interconnected local area networks to a complex global network of routers both wired and wireless. This network has rapidly become embedded in the fabric of society. People use it for everything from email and web browsing to file transfer and Internet telephony. And its importance is likely to increase. Thus, in recent years, the study of the Internet and the way it behaves has taken on an increasing importance. One of our quests is to study the temporal properties of the Internet, such as the way patterns of congestion change in time. 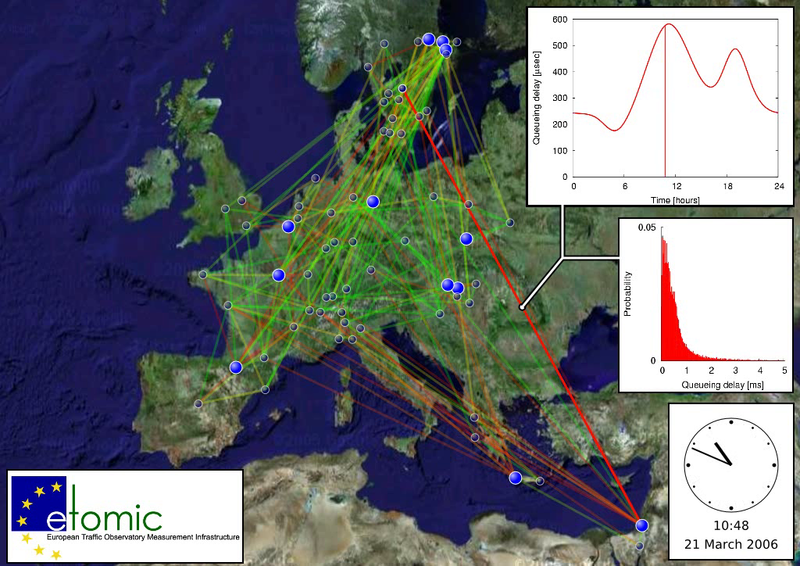 We introduce measurement and evaluation techniques of network tomography to reveal the dynamic properties of the European Internet: the delays experienced by data packets as they move across the network. We study the distributions of queuing delays over a large part of the Internet in Europe and draw a map of network congestion. We are able to analyze the spatial structure of the Internet and identify highly congested or faulty segments.